Are Tax Debts Dischargeable in a Chapter 7 Bankruptcy? While a Chapter 7 bankruptcy is designed to give a debtor a “fresh start,” that does not necessarily mean that you can eliminate all of your outstanding debts. Congress exempts a number of categories of debt from discharge through bankruptcy. Not surprisingly, one such exemption covers tax debts owed to the government itself. According to the Bankruptcy Code, a debtor cannot discharge any debt for a tax “with respect to which the debtor … willfully attempted in any manner to evade or defeat such tax.” This means that if you do file for Chapter 7 bankruptcy, the IRS can seek to prevent discharge of your outstanding tax debt if it can prove two things: first, you engaged in some sort of conduct designed to avoid paying a lawful tax you owed; and second, your actions were voluntary and intentional. Recently, a Bankruptcy Court in Tampa refused to discharge a multi-million dollar income tax debt owed by a married couple after finding the IRS proved both of these elements. This case is especially instructive in how not to convince a bankruptcy judge to allow discharge of a serious tax debt. 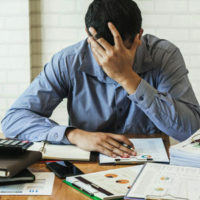 The debtors earned most of their income through the husband’s work as an “investment professional.” During the 1980s and 1990s, the husband used short sales of stock to (legally) defer his income tax liability. By the time the husband’s short-sale strategy “collapsed,” in the words of the bankruptcy court, he owed approximately $2 million to the IRS. When the couple subsequently liquidated assets to pay this debt, they ended up incurring an additional $3.2 million in new tax liabilities on the sales. Over the next 15-plus years, the debtors played a dodge-and-delay game with the IRS, offering to settle the tax debt on multiple occasions only to later default on the agreements. Meanwhile, the debtors continued to maintain a high-spending lifestyle. When the debtors eventually filed for Chapter 7 bankruptcy–specifically seeking to discharge their tax debt–both the IRS and the bankruptcy judge called the debtors out on this behavior. For example, while the debtors claimed they were unable to pay their back taxes, they spent “nearly $1.5 million over a seven-year period to live in a multi-million dollar house–housekeeper and gardener included,” according to the bankruptcy judge. They also employed a full-time chef (at a cost of $6,000 per month) and spent over $500,000 on clothing and personal care. Altogether, they spent “more than $8.5 million to support their abundant lifestyle,” while maintaining they were too poor to pay the IRS. Need Advice on Dealing With Your Debts? The reality is that even if you do not follow the example of the couple above and make every effort to pay your tax debts, you may still be unable to obtain a discharge in bankruptcy. But you may have other options available in dealing with the IRS. If you need advice from a qualified Miami Chapter 7 bankruptcy attorney on how to deal with your particular debt situation, contact the Law Offices of Julia Kefalinos today at 305-676-9545.